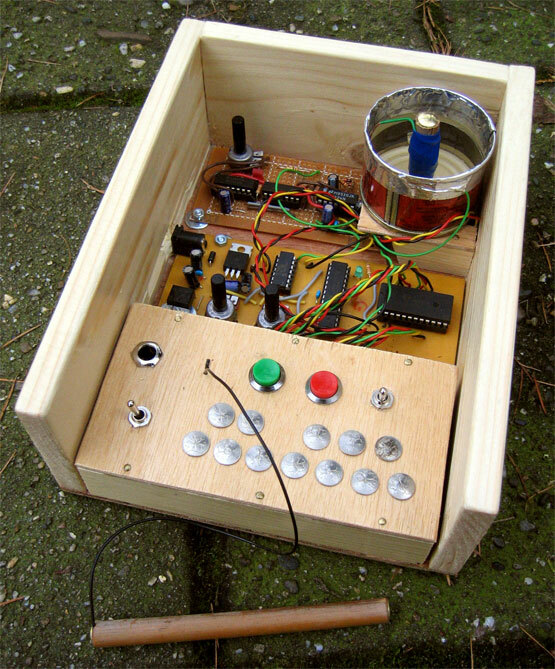 The pot osc is basicaly a potentiometer that go's around and around, if you make a potentiometter go around and around it will generate a saw (if connected right), but if you make a potentiometer that is 2 potentiometers after eachoter (with the last one in reverse), you should get a sine wave. So in this project i try'd to make a sine, using a can with magnetic tape as a resisting strip, and a motor that makes a drag contact wire.. drag along side it to generate a sine.. (vage description.. just look at the images). Unfortunatly it is not working verry well, because if bad mechanical design.. But in the end it still sounded quite nice so i decided to keep it. sketch of pot osc principle.. There is also a extra circuit in this one.. limiter with sample and hold, and a lowpass filter on the volume control pot. extra circuit of pot osc.